So I suddenly have a cinnamon sugar obsession. I guess that’s not something that’s not so suddenly new for me :), I’ve always loved anything cinnamon sugar. The Browned Butter French Breakfast Muffins I made yesterday which were generously coated in cinnamon sugar reminded me that I’ve been wanting to make and post a snickerdoodle cupcake – so here it is. 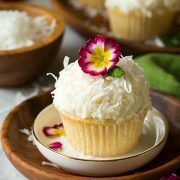 These are without a doubt one of my new favorite cupcakes (do I say that every time I post a new cupcake recipe :). I think it’s that unbelievably fluffy vanilla buttercream I can just never get enough of. But really these are so much more than just their frosting.The entire cupcake was utterly and inexplicably delicious! 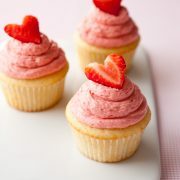 Whenever I create a cupcake that first bite is always a big oooh I hope they are going to be good – because as you know baking is a science so when I make a cupcake recipe I’m never certain how it will turn out. I always hope for the best and with these I’m going to have to say I got it. 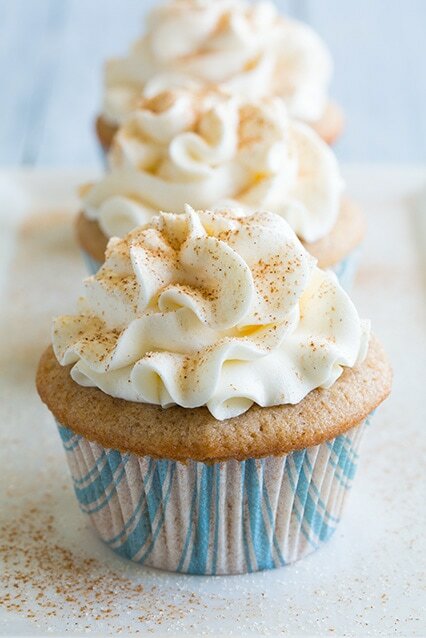 I would take these over a snickerdoodle cookie any time any day, and don’t get me wrong I’m a total cookie lover but these are basically that cookie in fluffy cupcake from, with a generous amount of frosting topping them and a perfect little dusting of cinnamon sugar. I love cupcakes, the flavor options are endless. 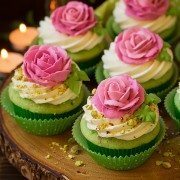 Please make this version of cupcakes one you make soon, you won’t regret it (except maybe when you are going back for your third cupcake). Enjoy! 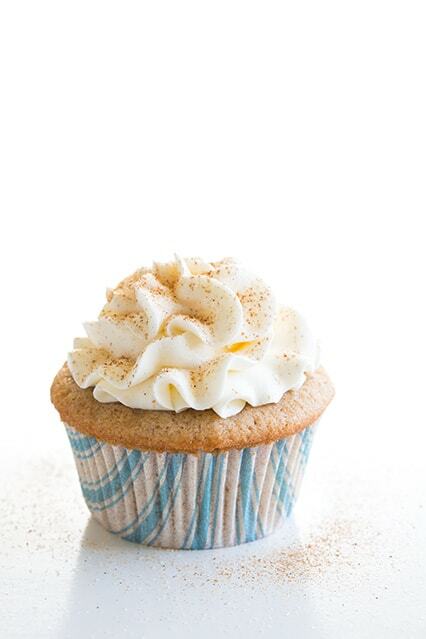 Soft tempting cupcakes with sweetly cinnamon spiced snickerdoodle flavor! Preheat oven to 350 degrees. In a mixing bowl whisk together flour, cornstarch, cinnamon, nutmeg, baking powder, baking soda and salt for 30 seconds, set aside. In the bowl on an electric stand mixer fitted with the paddle attachment, whip together butter, 1 Tbsp of the vegetable oil, 3/4 cup granulated sugar, and light-brown sugar on medium-high speed until pale and fluffy. Blend in remaining 2 Tbsp vegetable oil. Mix in eggs one at a time blending until combined after each addition and adding in vanilla with second egg. Blend together milk and buttermilk in liquid measuring cup or bowl. With mixer set on low speed, add in 1/3 of the dry ingredients in three separate batches alternating with 1/2 of the milk mixture, beginning and ending with flour and mixing just until combined after each addition. Divide batter among paper lined muffin cups, adding about 1/4 cup batter to each cup and filling 2/3 full. Bake in preheated oven 17 - 20 minutes, until toothpick inserted into center comes out clean. Remove from oven and allow to cool in muffin tin several minutes before transferring to a wire rack. Allow to cool completely then frost with vanilla buttercream frosting, then in a small bowl, whisk together remaining 2 tsp granulated sugar and 1/2 tsp cinnamon. 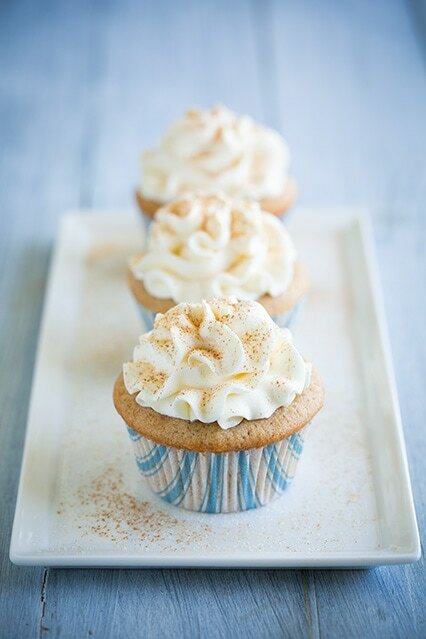 Dust tops of cupcakes lightly with cinnamon sugar mixture. In the bowl of an electric stand mixer, using the paddle attachment whip butter on medium high speed until nearly white and very fluffy, about 7 - 8 minutes, frequently scrapping down the sides and bottom of the bowl (note that if you have the paddle attachment that constantly scrapes the bowl you can reduce the time by several minutes). Blend in vanilla extract. Add in powdered sugar and heavy cream and mix on low speed until combined, then increase speed to medium and beat until very light and fluffy, about 5 - 6 minutes, frequently scraping down the sides and bottom of the bowl. Spread over cooled cupcakes. The butter should be soft - not cold and not melted so if doing it in the microwave be sure to do it in low increments (like 4 seconds) and rotate butter between increments just until soft.